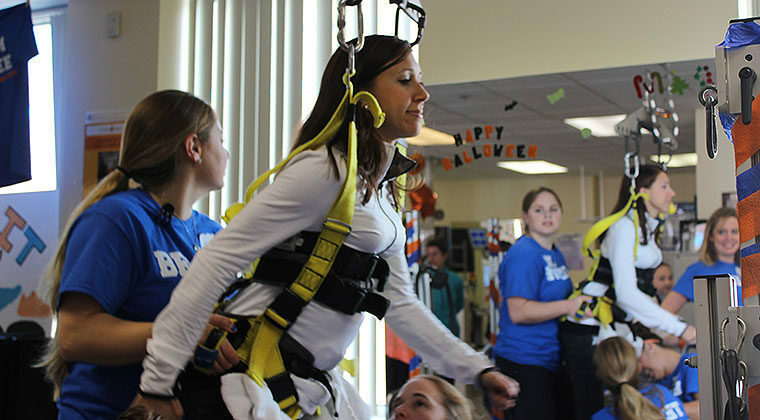 The Reeve Foundation’s NeuroRecovery Network® (NRN) is a network of cutting-edge clinical centers and Community Fitness and Wellness Facilities that make up two branches of care for people living with spinal cord injury and other physical disabilities. In these facilities, activity-based exercise programs are designed specifically for clients with physical disabilities to enable them to be “fit for life." Locomotor Training is also offered as a membership option. They are staffed by athletic trainers, personal trainers and exercise physiologists, all of whom have received specialized NRN training. First step is getting a referral and completed medical release from a physician to receive this therapy. This states that he or she is medically and physically stable to participate in the NRN program. All potential participants must be seen by the NRN physician and physical therapists at the NRN facility to be screened for any complicating medical issues that would make this therapy inappropriate. Following this evaluation, if deemed appropriate for this therapy, a plan of treatment will be established. There are currently 11 NRN sites located nationwide: Six are clinical centers and six are community fitness and wellness facilities. The Reeve Foundation is working to expand the NRN and add additional locations as quickly as possible.